We know the Tranquility Device helps to re-naturalize water and contribute to plants, animals, and humans being healthier. Thousands of personal experiences and studies have shown us how benevolent just structuring water is, but what about going beyond just structuring water by restoring its very nature? The mysteries of water are still being studied around the globe. (See RESEARCH page.) New insights are emerging as we begin to understand how structured water works, allowing us to utilize it more effectively. The mild vortexing demonstrated in some structuring devices can contribute to the hydrogen and oxygen clusters so that they are able to carry nutrients into the cell more readily. When water is still in large clusters of 50 - 600 dyne or more, the cell needs to expend energy (ATP) to break these bundles down to 46 dynes or smaller. Pollutants are encapsulated in each bundle and isolated in a manner which sends them off with the rejects of plant and body systems. 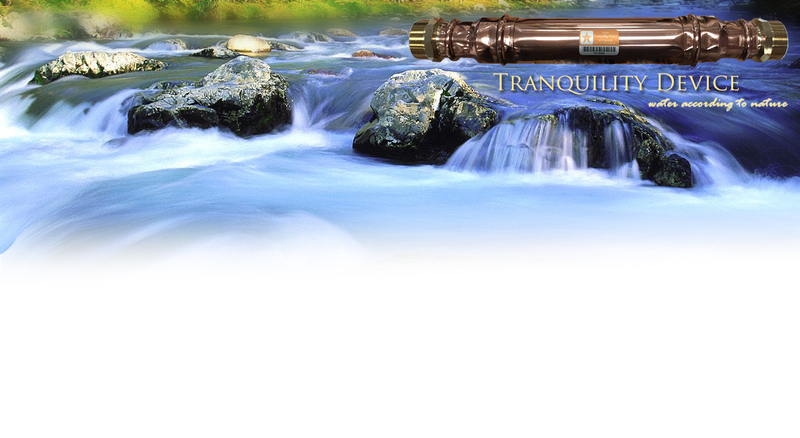 At the Tranquility water’s 42 dynes or less, nutrients are easily passed through the very selective passageways in the cell wall and with what appears to be all mineral ions (70+) known to exist in the food chain. When this form of water is available in its super-hydration form, the life system is able to perform this task rapidly and toxins are minimized or not allowed to linger. The more effective the re-naturing of the water is in plants or the body, the more nutrients are delivered, and the faster toxic excess is carried off. ATP is our basic unit to produce and transmit energy. It is essential that our water to supplement ATP be in the best possible form. Water is our most precious resource. Our lives depend on it. We’re finding out what water does and supporting it do what it naturally does best. At Lifestar we are beginning to learn how to naturally and biodynamically nurture the water that nurtures us. The lowest yielding strawberry field was chosen for the test site for one structured water unit. Within 2 days the newly structured water field produced strawberries of 12 BRIX level of sweetness. The first and second pick on other fields remained at the usual 6 BRIX level. Same fertilizer. Same watering schedule. After the second harvest, all scheduled fertilizer and watering ceased on all fields. While other fields turned brown and barren, the test field continued to produce huge 3” fruits with higher 12 BRIX nutrient count. PURIFY DRINKING WATER with 7” Portable Device. Backpacking & Hiking. Straight from any faucet. Travel or dining out. Wine flavor “instant aging”. PERSONAL at HOME USE with ¾” and 1” House Device soft water without salt additives. Smoothes dry skin. Clean healthy hair. Use less soap & detergents. Good tasting, clean tap water. Healthier assimilation of nutrients. Spotless dishes. Car wash too. CALCIFICATION BUILD-UP & STAINS with ¾” and 1” House Device dislodges faucet crust. Cleans plumbing for better flow. Cleans swamp cooler filters and hoses. Water heater lasts longer. Lifts & prevents iron & copper stains. ELIMINATE ALGAE with pipe size of ½” Shower or ¾” or 1" House, Garden, or Commercial Device (1.5", 2.0", 3.0" and 4.0"). Water features and fountains clear up. Fresher water in ponds and tanks. aquariums stay cleaner. Swimming pools use less or no chlorine. LANDSCAPING - GARDEN - FIELD CROPS - ORCHARDS - FRUITS & VEGETABLES with pipe size of ½” Shower or ¾”, 1”,1.0” House, Garden, or Commercial Device (1½” tp 4.0"). Greenhouse & crop drip systems. Double and quadruple BRIX nutrient level. Faster growth. Healthier produce. Reduce or eliminate need for pesticides. Plants withstand freezing temperatures better. Increased harvest yield. Needs less water. POULTRY & LIVESTOCK DRINKERS & TANKS with ½” Shower or ¾”, 1”, 1.5" House, Garden Hose, or Commercial Device (1½” or over). Dairy increase in milk yield & butterfat content. Sleek coat, better weight gain. Less water and feed needed. Less meat damage in processing. Better fertility rate. Less time in breeder barn. Mature sooner. INDUSTRIAL WATER COMPLIANCE 1” to 4” pipes (can be customized for flow) Inexpensive restoration of process water. Environmentally responsible. 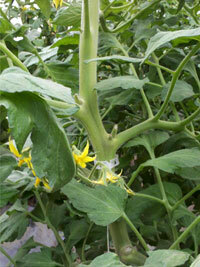 The tomatoes are growing very tall bushes with lots of blooms. Notice strong stem and the thickness of it. Indiana Greenhouse using the pre-device testing of our Tranquility Device. This Device produces significant increases in water hydration levels (wetter water), particularly with high water consuming plant and animal forms such as dairy cows, feed lots, cattle, birds, fish, nurseries, vineyards and orchards, while lowering the total amount of water usage which in some applications can be substantial. Think about that for a minute.... Better performance with less costs. Isn't that the way Nature operates by providing the most benefit with the least amount of effort as compared to what "man" typically does? The Tranquility Device works by naturally producing millions of simultaneous microscopic vortexes within the water within a relatively short distance without using any man made material such as plastics, glass, stainless steel, magnets, electricity or concepts such as sacred shapes or geometry and without any side effects. The Tranquility Device doesn't use any energy to do this. Higher hydration levels translates into healthier soil and higher nutrient levels with less effort and lower insect infestation. In some cases the expected insects don't even show up. The Device is effective in the following examples and not limited to them. Increase in all plant growth rates including Fruits, Vegetables, Medicinal plants including Medical Cannibus, Ground Cover including Trees, Bushes and Cacti. Improvement in the health of all Humans, and Animals including Dogs, Cats, Birds, Reptiles, and Fish. All Veterinarian, Kennel and Zoo applications. Increase in essential soil bacteria and other supportive organisms. There will be less to no necessity for re-mineralization for most applications. Farm animals including dairy cows are naturally attracted to water that has passed through the Tranquility Device and will usually ignore any other water that is also available. Increase in milk production and its protein content. Pet dogs prefer the Tranquility Device water over tap water. In one observation using well water, bacteria found and monitored in the water before passing through a Tranquility Device was not found in the same water after passing through the Device. That particular model of the Tranquility Device was an earlier version and did not employ any of the newer features of the current Device. All “wash down” cleaning in processing environments, sewage treatment, steam production, sanitation and recycling, car and truck washing, laundry, tableware, showers, chemical processing, plaster and concrete manufacturing. Water reclamation and restoration. Significant reduction in surface tension and water molecule clustering sizes. Significant improvements in nutrient density of plants (BRIX levels). Increases in excess of 150% are common. Faster growth rates including sprouting, pest reduction or elimination, reduction in yeast and mold growth, higher plant yields and less water consumption than with previous harvests. 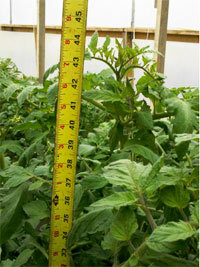 Hydroponics and other hot house applications, indoor and outdoor row, canal and drip irrigation systems. 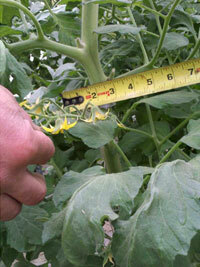 An apparent reduction in frost or freeze damage to plants. More replicated testing is required for authentication. • While the Tranquility Device meets the current general definitions of a “water structuring device” and a “flow form device” it exceeds both definitions. • The external and two internal parts of the Device structure are lead free pure copper made in the United States. The lead free copper reducers and lead free bronze fittings are made in Germany. • The Device is ideal for Organic and Biodynamic applications. • The Device meets all environmental requirements of the European Union. • All design, testing and assembly of the Device is performed in the United States exclusively by Lifestar.